How to use Ajax BalloonPopupExtender? Have you ever used Ajax BalloonPopupExtender? If not then this is the right time to learn how to use Ajax BalloonPopupExtender. Ajax BalloonPopupExtender allows you to make a rich webpage with less code which help to attract the user. To use Ajax BalloonPopupExtender, first you have to install Ajax control toolkit.ajax control toolkit is free to download from CodePlex using the link Ajax Control Toolkit. After installing the AjaxControlToolkit you may add the controls in your toolbox. Once you add the controls in ToolBox you will find BalloonPopupExtender control. There are many places we can use BalloonPopupExtender. Mainly we use this as a tooltip to get nice look and feel. You may also use this to show some information or alert to the user. 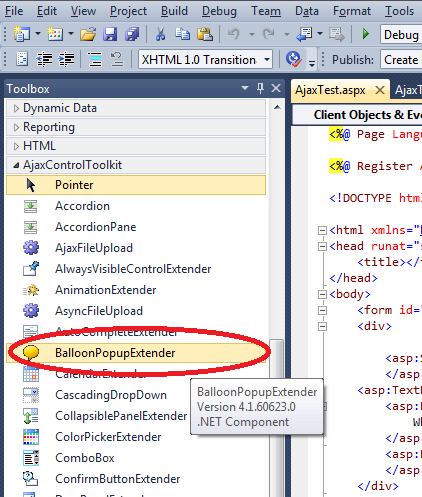 Now we will see how to use Ajax BalloonPopupExtender. First we will add a text box, a panel and then the BalloonPopupExtender. BalloonPopupExtender shows the text entered in the panel on click or focus of the TextBox. What is in your mind !!! BalloonPopupExtender has got three style to show the pop up. Default style of the BalloonPopupExtender is Rectangle. In this application I haven't used all the properties of BalloonPopupExtender. You can try adding more properties to make the webpage more attractive. hi.. i am using the ballon popup extender in my project. my requirement is i am having gridview inside that i am having images when user places the mouse on image i need to display the details of that image in detail inside the ballon popup. how i can achive this. Please help me in this.. i am expecting reply as soon as possible.